home / Multimedia / The Holy Land in news / Damascus. The long way towards recovery and the new enemies of ..
“Absolutely no! War has not come to an end yet, it has just begun. ” Perhaps the enemies are no longer called Daesh or Al Qaeda, but hunger and poverty, tand these are enemies that are equally scary. They are the enemies that international politics can arm in a more silent and sneaky way, without mortars and away from the spotlight, with the economic sanctions that in these months are literally putting Syria to its knees. This is why the sentence pronounced by Fra Antonio at the beginning assumes that dark and sad accent of those who do not create easy illusions about an uncertain future. Damascus is on its knees, the electricity that comes in fits and starts shows the face of a country forgotten by the media, but victim of a worse humanitarian emergency than in the past years, when the Syrian capital was broadcast on all the newscasts. We are in Bab Touma, the ancient door of St. Thomas, headquarters of the projects of ATS pro Terra Sancta in the land of St. Paul. We thought we were on the road to recovery, and instead we are in an emergency. 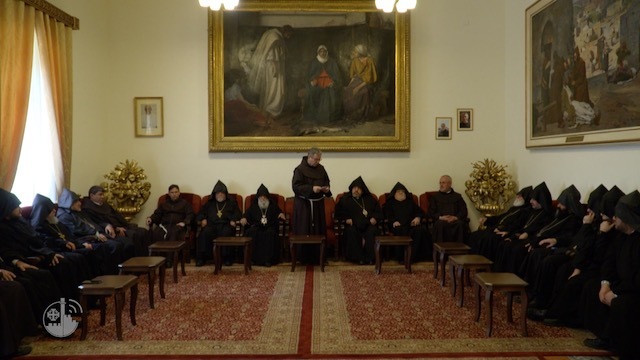 Families of four who barely live in a room of a few square meters, sick people who cannot afford to buy life-saving medicines, displaced people who fled quickly from Homs, Maaloula, Knayeh: those days spent in Syria to meet, in talk to the people welcomed by the friars. With Fadia and Ayham, our good collaborators in Damascus, we spend the days with them trying to understand their needs, and also their hopes. “We lived in Homs until a few years ago, but with the war we escaped.” Rita, who barely holds back her tears, speaks to us from the bed, where she has been chained for several months for a back disease that leaves her no respite. “My husband was a painter, we were not rich but we had something to live”. Then the war, and the sad script we used to know. “We came to Damascus, knocking on so many doors to ask for help. The only one who is open is yours “. Rita talks about the emergency center opened by the Association pro Terra Sancta in the Franciscan convent in Bab Touma, where we have been taking care of difficult cases like this for several years. “My son is 16 and has suffered many traumas with the war. He no longer speaks, he has no friends, I am desperate ”. 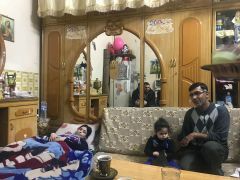 Rita is still in bed, her husband is looking for a job to keep that family plagued by war: they can’t emigrate, but only hope to be able to care for themselves and stay alive, while waiting for the economy to recover. The hope of returning to life today has a face, and a place. The same place that also welcomed Hana, who came to Damascus to be cured of cancer. In his country, Hassakeh, no proper care was found. “I couldn’t go back and forth every time I had to get cancer treatment, so I looked for a place to stop. Providence wanted me to meet the friars of Damascus. Without them I think that today I would not be here to tell you about it “. The line of people helped by our projects started with the collaboration of the parish is long, and full of stories like these. Dramatic, difficult, yet with a fund of hope. Syria today. People from Damascus, Aleppo, inhabitants of every where in the Syrian chessboard where international powers battle. Economic sanctions have brought them to their knees. But luckily there are those who do everything to keep them upright.